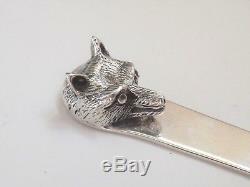 Antique Sterling Silver Fox Head Letter Opener. Asprey & Co - Chester 1931. 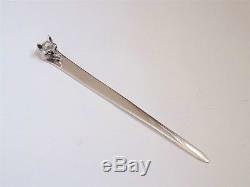 This is a fine quality English made letter opener or letter knife - the item could also be used as a large page marker if so desired - the item was manufactured and retailed by the prestigious Asprey & Co Ltd. 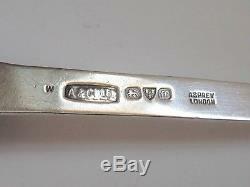 The opener follows an antique style that has been around since the early 20th century or possible the late 19th century - this piece carries silver hallmarks for Chester 1931 and sits firmly within the Art Deco era - there is also a stamp for'Asprey London' which suggests it as retailed through their London retail store. 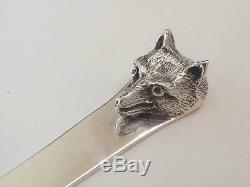 The letter opener is a classic design with with a flat blade that tapers down to a point - to the top is a nicely modelled three dimensional fox head - the reverse side of the opener is flat backed as can be seen in picture 5. 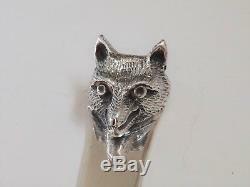 The item measures 13cm in length and is 1.3cm at its widest point (across the foxes ears) - the total unpacked weight is 20.2g. The condition all round is excellent and the item shows only the lightest signs of wear - the item is clean and ready to use or to give as a gift to someone. This item is a fine quality piece by a famous, prestigious and highly collected maker, and it would make a nice gift for someone into country pursuits or who likes fox related collectables - or perhaps you're a Leicester City supporter (the foxes) who wants something a little different. Please study the images provided to satisfy yourself as to the condition of the item - if you have any further questions please ask and I'll be happy to oblige. 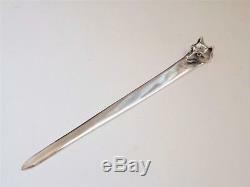 The item "Antique Sterling Silver Fox Head Letter Opener Asprey & Co Chester 1931" is in sale since Sunday, August 5, 2018. 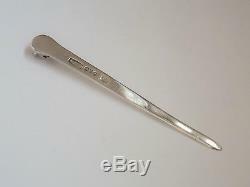 This item is in the category "Collectables\Pens & Writing Equipment\Letter Openers". 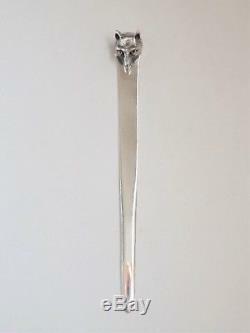 The seller is "century-antiques-uk" and is located in Wigston. This item can be shipped worldwide.